Gemalto, the world leader in digital security, has announced that Identify3D, the most advanced security solution for digital manufacturing supply chains, has deployed Gemalto’s SafeNet Data Protection On Demand to ensure the security of its customers’ intellectual property and quality of their digital manufacturing services in the cloud. With customers in extremely security-conscious sectors such as aerospace and defence, it is critical that Identify3D builds strong data security controls into its cloud-based services in order to protect customers’ sensitive information and intellectual property. After looking at on-premises alternatives and cloud providers, Identify3D selected SafeNet Data Protection on Demand due to its ability to provide a wide range of cloud-based hardware security module (HSM), encryption, and key management services that easily integrate with the applications and cloud services it already uses. With SafeNet Data Protection on Demand, Identify3D was able to deploy a cloud-based HSM service to act as the root of trust for its certificate authority and support advanced algorithms. The company is now able to offer its customers secure digital manufacturing services while enjoying the flexibility and scalability of a managed cloud-based security service with zero upfront investment. 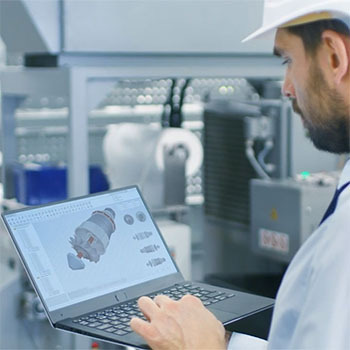 “Identify3D can now provide our customers unrivalled protection of their valuable data and intellectual property, while verifying that their manufacturing is authorized and authenticated according to the exact standards. Within a couple of months of the solution being implemented, we saw a significant 35% cost saving and are able to add new clients quickly and efficiently in less than an hour,” added Thomas.